The regular quinquennial review of airport charges at London’s three biggest airports has finally come to its conclusion. As always, this has been an exercise in attempting to reconcile the irreconcilable. Nevertheless, with the publication of its final decisions on 10-Jan-2014 (not to be confused with its ‘final proposals’, published in Oct-2013), the UK’s Civil Aviation Authority (CAA) has ruled a line between the wishes of the airlines and airports. After very substantial price increases in the previous regulatory period, the clamour from airlines for the CAA to place more aggressive caps on airport charges for the period 2014 to 2019 appears to have been heard. At Heathrow and Gatwick, the CAA’s price caps are below inflation. Not low enough, say the airlines, but their comments do not have the same vehemence as in the past, while these two airports sound genuinely dismayed by the decisions and by the changes since Oct-2013. At Stansted, price regulation is to be abandoned altogether as the CAA now judges that the airport no longer has substantial market power after long term agreements, incorporating price discounts, were struck directly with the main airlines there. 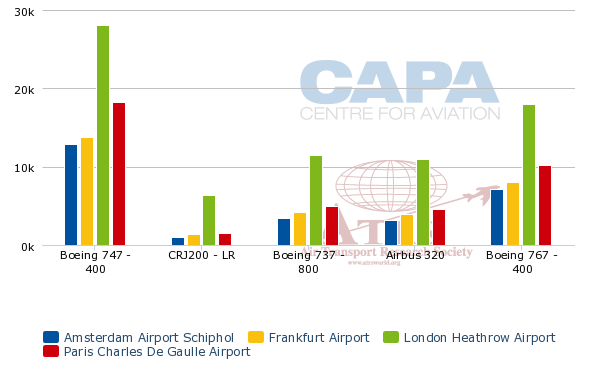 The CAA’s final decision for a Heathrow price cap of RPI -1.5% (i.e. annual increases limited to 1.5% below retail price inflation) compares to its Oct-2013 proposal of RPI +0% and its initial proposal in Apr-2013 of RPI -1.3%. After going up and then down, the CAA’s final price cap is a long way above the airlines’ suggestion of RPI -9.8% and significantly below Heathrow’s own proposal of RPI +4.6%. The final decision will see Heathrow’s per passenger airline charges fall in real terms from GBP20.71 in 2013/14 to GBP19.10 in 2018/19 (in 2014 prices). Heathrow’s Alternative Business Plan would have seen charges rise to GBP25.72 in 2018/2019. By contrast, Virgin Atlantic CEO Craig Kreeger was more combative: “We were baffled at the CAA’s decision in October to increase the Heathrow settlement from their original recommendation,” he said in a statement. “Today’s decision is a far cry from the reduction needed to mitigate the incredibly steep price rises customers have seen in Heathrow airport charges in the last few years. Prices at Heathrow are already triple the level they were ten years ago…”. The CAA’s final decision for Gatwick is a little confusing in terms of the price cap chosen. The airport has made a set of commitments to its airlines on service conditions, investment and a price cap of RPI +0%. The CAA describes the airport’s commitments as “in passengers’ interests”, provided that they are backed by a licence “to ensure they are honoured and prices remain fair”. Nevertheless, the CAA calculates its own “fair price path” at a tougher rate of RPI -1.6% and says that it will monitor prices to see whether they are consistent with its view rather than Gatwick’s commitment. It argues that the “CAA's monitoring and the threat of additional licence conditions create incentives for GAL to moderate price increases and deliver growth”. It will intervene “where appropriate to protect users”. The CAA also says that it will scrutinise the costs associated with a second runway, if Gatwick is chosen by the Airports Commission for additional runway capacity, before they can be passed on to airlines. Essentially, the procedure at Gatwick marks a departure from the traditional price cap approach adopted in the past, but with the threat of a return to it if the CAA judges that Gatwick is not meeting the commitments enshrined in the licence. The airport’s price commitment and the CAA’s view of a fair price have both come down from Oct-2013, when Gatwick’s commitment was to RPI +0.5% and the CAA proposed a fair price of RPI +1.6%. Both are above the airlines’ suggestion of RPI -9%. Airport charges per passenger at Gatwick are currently GBP8.80 and would remain unchanged (2014 prices) for seven years under Gatwick’s commitment. The CAA’s price assessment at RPI -1.6% p.a. would equate to airport charges per passenger in 2018/19 of GBP8.07 (2014 prices). However, the airport added that it was “very disappointed with key elements of the CAA’s final decision, including the over-optimistic long term passenger forecasts, the reduction in the cost of capital, and the more onerous monitoring regime.” Like Heathrow, it drew attention to the changes made since the CAA published its ‘final proposals’ in Oct-2013. It also disagreed with the CAA that the airport has Substantial Market Power (SMP) and as a result requires an economic licence. The airport’s disappointment was not shared by its biggest customer. EasyJet released a statement saying that it welcomed "the CAA's decision that Gatwick Airport has substantial market power and that as a consequence Gatwick needs continued regulation through an airport licence.” Its statement used the word ‘welcomes’ four times and was about as effusive as such statements can be. After Stansted Airport reached long-term commercial agreements on prices and traffic with its main airline customers in 2013, the CAA consulted on whether or not the airport should continue to be regulated. The CAA has now concluded that Stansted does not have substantial market power and the airport should be free to compete with other airports without the need for price regulation from Apr-2014. See related report: Ryanair’s new growth deal with London Stansted Airport: mutual love-in? Charlie Cornish, the chief executive of Stansted’s owner MAG, said that his company had focused on “building strong commercial relationships with airlines and delivering a better experience for passengers”. He added that the long term growth deals agreed with airlines - including Ryanair, easyJet and Thomas Cook - would see Stansted continue to grow rapidly over the next decade. Perhaps not surprisingly, Stansted airport’s biggest customer, Ryanair, took a typically robust view, saying that the CAA had put “the foxes in charge of the chicken coop”. The LCC criticised the CAA’s “false claim that Stansted airport does not have substantial market power, and the consequent deregulation of Stansted”. It argued that the CAA’s decision is contradicted by the regulator having allowed Stansted to “double its charges in 2007”, causing a “5 year 27% traffic collapse”. Ryanair added: “Even easyJet moved flights to Southend to avoid Stansted’s high charges”. This action by easyJet was cited by the CAA in support of its argument that the airlines at Stansted now have countervailing buyer power. The CAA also noted that the prices under the long term growth deals agreed by Stansted with Ryanair and easyJet were significantly lower than the 2013/14 regulatory price cap. For now, it seems that the airlines are getting, through their own agreements, at least as good a deal as they might have expected from a regulatory price cap at Stansted. As for Ryanair’s fear that deregulation may lead to future price increases (presumably in the event that the agreements break down in some way), the CAA says that it may review its decision if the deals do not last. After very significant double digit percentage price increases at all three airports in the last regulatory period (see chart above), the CAA’s final decisions should result in only single digit increases in nominal airport charges at Heathrow and Gatwick in 2018 relative to 2014, below the rate of inflation (see chart below; note we use an assumption that RPI = 3% for illustrative purposes). At Stansted, the price increases or decreases will be determined by the deals struck with the main airlines. It seems likely that these deals will deliver price caps at least as favourable to the airlines as the RPI/2 limit that the CAA proposed in Apr-2013, which would also imply a single digit increase over the period in nominal prices. It is in the nature of such processes that neither side professes itself to be happy, but it does seem that the airlines are generally happier than the airports this time, particularly at Gatwick and Heathrow. At Stansted, the likelihood is that both sides are content with the deals they have freely agreed. This time the CAA seems to have drawn its line closer to the airlines than to the airports. The really big debate will kick off when the UK’s Airports Commission finally decides where new runway capacity should be built - raising the question of how to pay for it.